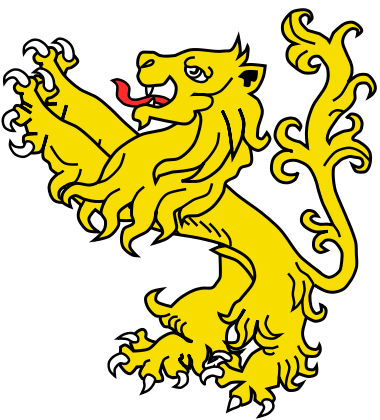 When I first started the Lion Rampant project, I chose the Clifford family as a loose background, mostly because it offered up the prospect of painting white livery, something a little bit different from the usual blue and red of the era. The tricky bit is painting a red wyvern on this white field. I have had a look around and found a couple of images that should help. 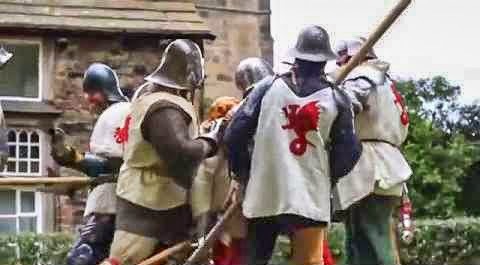 The first of these is from the Red Wyverns website, showing some of the re-enactors in action. Or rather, showing their surcoats in close-up, so I can see how they have tackled it. It's a perfectly adequate wyvern I suppose, but it doesn't quite work for me. The thing to note is there are three main features to portray - the sinuous body, the curled around tail, and the wings. I reckon the wings on this attempt are a little overdone. The second image is an artwork, and here I think the artist has done a far better job. The artist is Graham Turner and I am using his image without permission, hopefully this is not a copyright issue. The Graham Turner facebook page is an absolute treasure trove of military and medieval art, well worth a look. 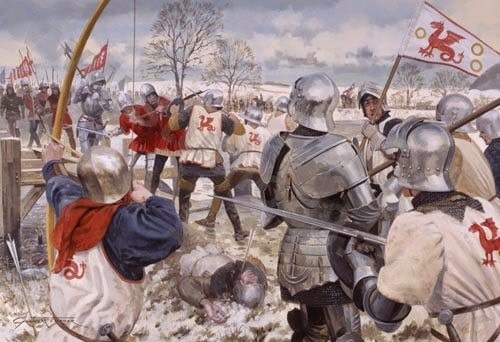 The image depicts the Clifford household fighting at the Battle of Ferrybridge. 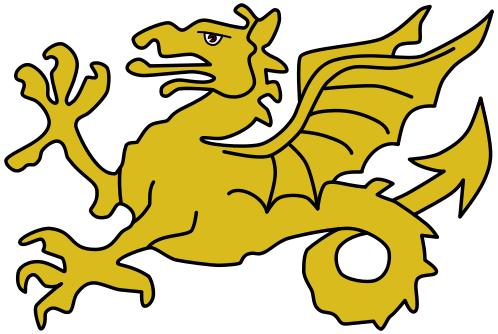 The wyvern motif here is far better in my eyes and for future reference there's even a flag I could use as inspiration. I am aiming for something like this, if I can recreate it on a tiny area of plastic surcoat. 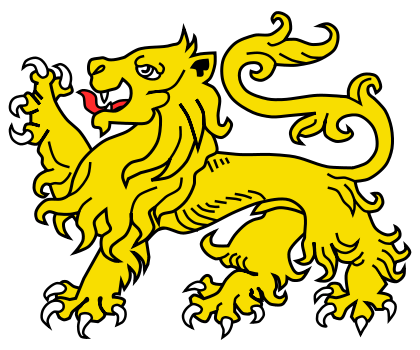 I have attempted to mimic this design on my flag, fashioned from a plastic pole and a piece of foil lid (from a yogurt pot is a good thickness). The design is almost a copy of the atwork, I have repositioned the front limbs a little and accentuated the sinuous body a little more. This will eventually be attached to one of the men at arms. I will probably bend the flag a little and maybe add a tiny bit of weathering. I have decided that 10mm is not the scale for me. I had big hopes and dreams for recreating the Battle of Five Armies on my tabletop and painted a few of the regiments, but ran out of steam before the end. So they are now on ebay, along with a few unpainted bits too. 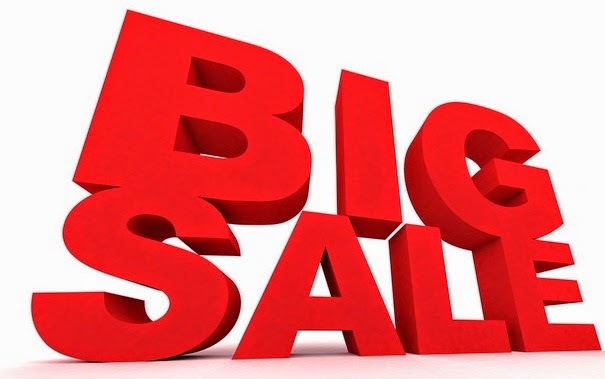 Here's the link to my ebay page. The summer of AD809 faded away, the days shortened, the cold winds blowing in from the North Sea heralding the return of autumn. Ivar and his men sat glumly in their camp, the seige of Tunnocellom dragging into the fourth month. Suddenly they were roused by the blast of horns - the Saxons had returned to liberate the townsfolk. Battle lines were quickly formed. Ivar shouted words of encouragement to his men, but they seemed unappreciative of his efforts. In contrast, the Saxons seemed buoyed, singing as they positioned themselves outside the town walls, no doubt their vocal chords well lubricated by mead. Ivar moved up quickly, hoping to strike a swift blow to the advance portion of the Saxon army. His men rushed to the attack, hurling spears and axes, but then faltered, pausing for breath. 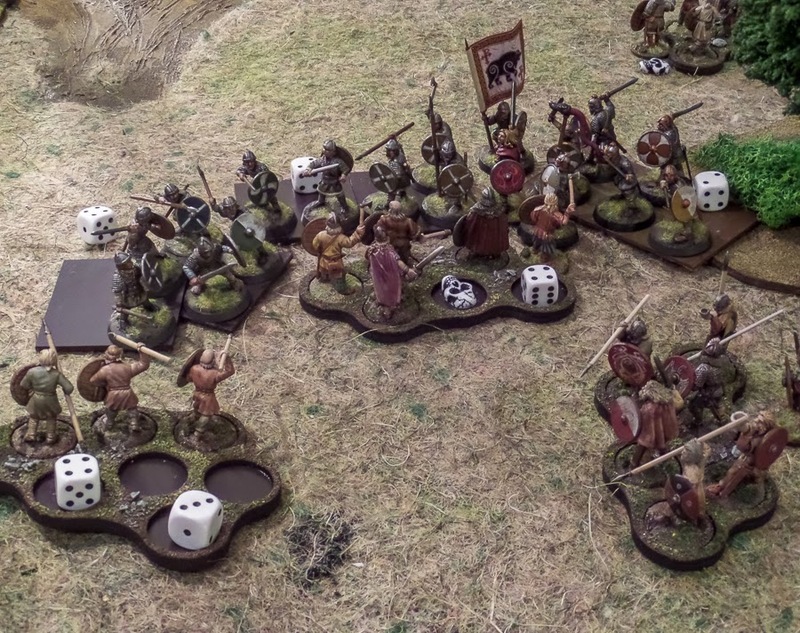 The two forces clashed, but the Saxons had the better of it and pushed the vikings away. The Saxon Lord seized on the hesitancy and continued the onslaught, bringing up more men to throw into the fray. Ivar and his men found themselves pressed on all sides and the Saxon's fury was unrelenting. Ivar's champion was just one of the many casualties in that brutal moment. Three months sitting idly outside the town walls had obviously not been ideal combat training. Casualties mounted on both sides in the vicious combat. Ivar could see his men were hanging by a thread and pushed forward to make a mighty effort, but suffered a wound for his efforts. The Saxons were out for revenge and were merciless. Dice = shock, skull = Ivar wound, another one on the way! Ivar's compatriots could see his perilous situation and rushed across to reinforce his efforts. They had sprinted across the fields to come to his aid and were poised to launch an attack, when a Saxon horn pierced the din of battle. Once more their seemingly blessed blades proved better and Ivar was struck again! His men, shocked at this calamity, dragged him from the field, blindly running into the reinforcements and carrying them from the battle too. It was a disastrous defeat. (My last ditch chance here was to hope my reinforcing noble activation came before the Saxon Lord, allowing me to charge in and help Ivar. And it did, but Matt played a step forth card to interrupt the sequence and finished me off, curse his Saxon dogs). The cards and the dice all seemed to favour the Saxons this day and Ivar suffered a hammer blow to his dreams. 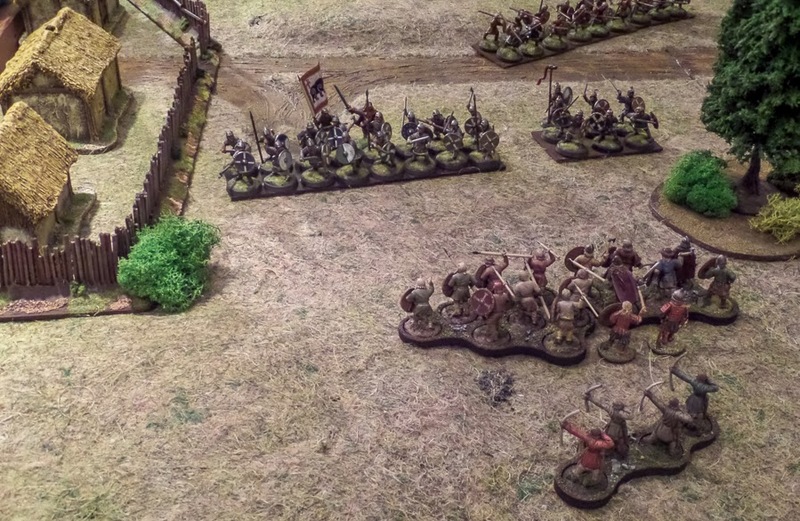 Two years into the campaign, he has just one sack of gold remaining, while the Saxons had such a mighty victory that they attracted even more to their numbers. As the vikings solemnly rowed back the their camp, utterly defeated, the Saxons began a building program, reinforcing all the border towns with watchtowers. 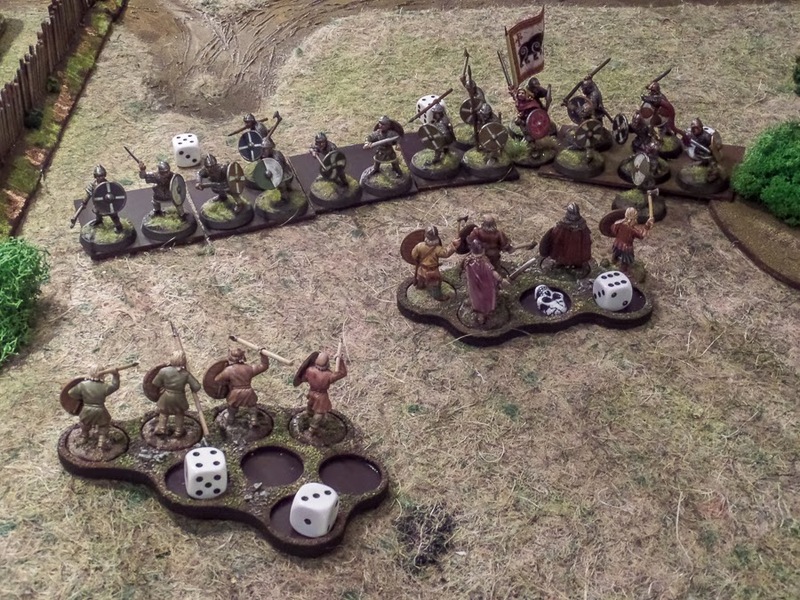 You can get a much better Saxon perspective (and better photos) from the wargamesinthedungeon blog. I'm not quite sure how we can progress the campaign from here, after half a dozen or so games, the vikings are right back where they started, the Saxons have gained four archers and a handful of towers. While we both enjoy the gaming mechanics, particularly during raid scenarios, the campaign seems painfully slow. I might have a tinker round and try to come up with some improvements, I'm not sure we could stomach another five years of this plodding. I wonder if anybody, anywhere, has actually completed a full blown conquest of a region campaign, it must take dozens of gaming sessions and months, even years of gameplay? As I mentioned last time, a couple of these are imposters - they are wargames factory rather than the usual Perry Miniatures. I don't think they are too jarring an addition. The whole unit has slightly more grassy stuff on the bases, to suggest they are sneaking around in long grass. It works for me! The bidowers wear more rustic clothing, to suggest they are likely hunters or maybe just peasants with bows. They are also more dynamically posed, to emphasise their more mobile nature. As a contrast, I have also re-photographed the more static archers. Together, these two units comprise the shooting element of my retinue. I will probably field the bidowers on a regular basis - gaining six extra bodies seems like a good idea, it will be interesting to see if losing the expert upgrade on a unit of foot sergeants makes much difference. *Joke, or maybe a pun. Bowmen who are widowers ie bidowers. Who writes this stuff? The Lion Rampant retinue has reached a milestone - it's fully built, if not yet painted. For the final unit I decided on billmen, only to find I didn't have enough bills, so I added a few figures in full harness with great weapons. 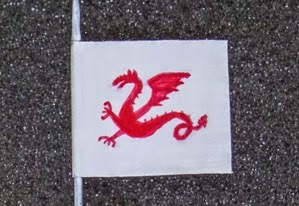 I also gave myself the challenge of making and painting a flag, a hand painted wyvern added to the to do list. With this unit glued together I had four figures left over and made them up as spare archers, intending to ocassionally swap out a few billmen to make a mixed weapon unit. But then I had a flick through the rulebook and decided it would be nice to have a unit of bidowers, which are only six strong. 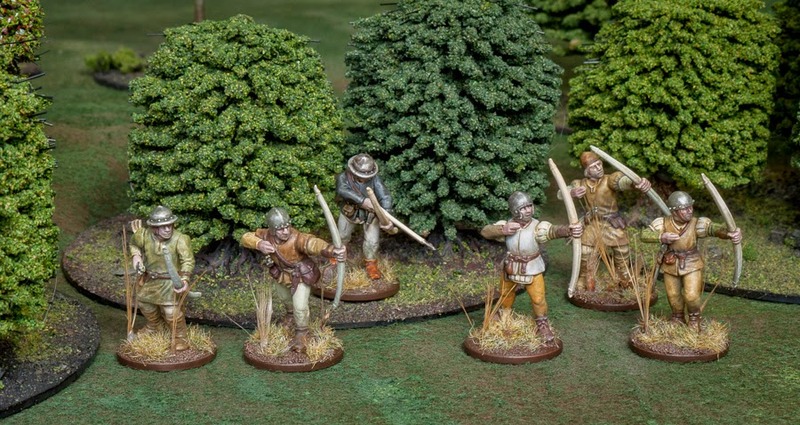 A couple of wargames factory Saxon bodies were used to make some extra rustic scouts. I tried to give these figures a little movement, to suggest they are running around and shooting rather than stood in mass formation. 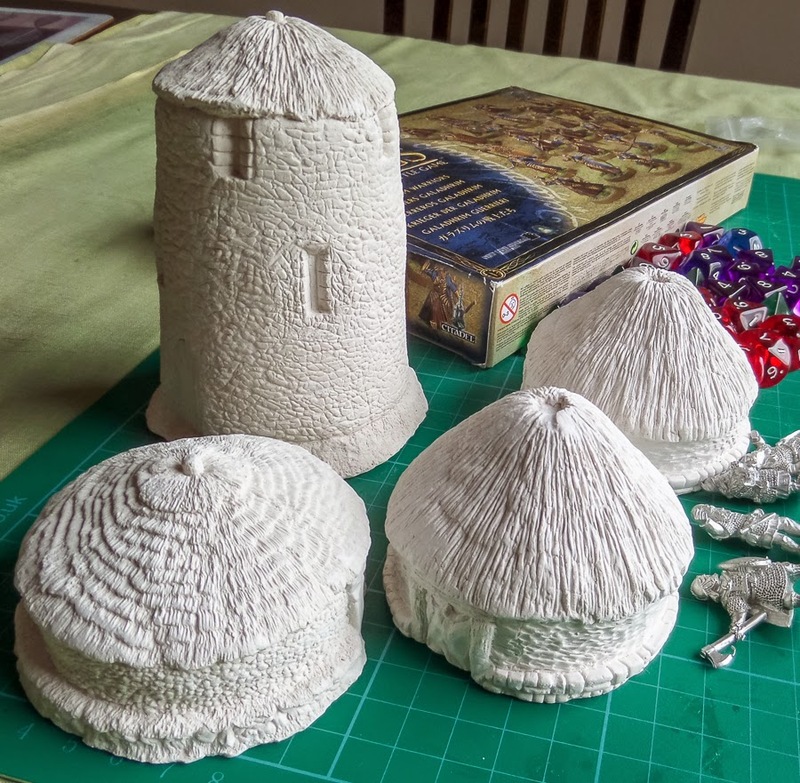 The two central figures in the unit are destined for the archers unit and will be swapped for a couple of the more rustic elements of that already painted unit. With these figures added to my already painted units I have a little flexibility in how I build the retinue. The usual set up will be men at arms, expert archers and two sets of expert billmen, giving 24 points exactly. However, by dropping one expert upgrade I can free up two points, enough for the unit of bidowers. As for painting, I am still hoping to get the men at arms completed by month end, then maybe the whole force by the end of March. 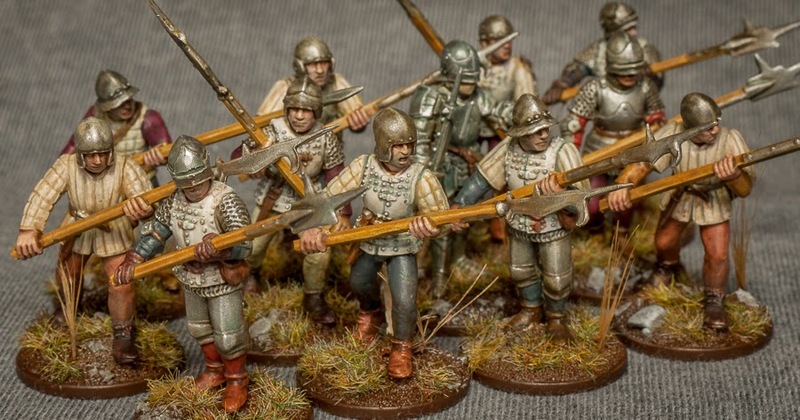 If light cavalry are released at Salute, I can foresee my retinue growing again in the near future. I just need to try playing the game now, to see if I actually enjoy it! 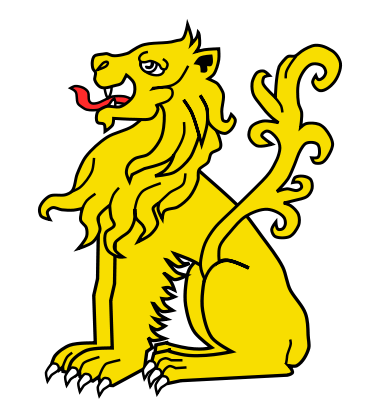 The Lion Rampant retinue is progressing far more quickly than I had imagined it would. I somehow managed to get the second unit finished in less than a week. I have also assembled and started to paint the third unit, which is extra easy and small to boot, so will have that done in a jiffy. I have so far exceeded my target of a unit a month. The only difficulty I have is deciding what to do for the last unit. I had carried out a little research to help me decide on the composition of my force, but all I really found out was that there are precious little records available and the ratio of billmen to archers varied across the country. So it's pretty much a best guess, which is probably more appropriate to a skirmish game like this one. I am leaning towards more billmen, as too many archers could prove a little tedious in game. I do also have the option of making a mixed unit, both bills and archers, so I may end up painting a mixture, with a few extras. That way, I could use them as a pure archer unit, a pure billmen unit, or a mixed unit. I would really like to have included some light cavalry, but they have not yet been released - I'm guessing they are being saved for a splash release at Salute? Hey Bill, you need a shave! 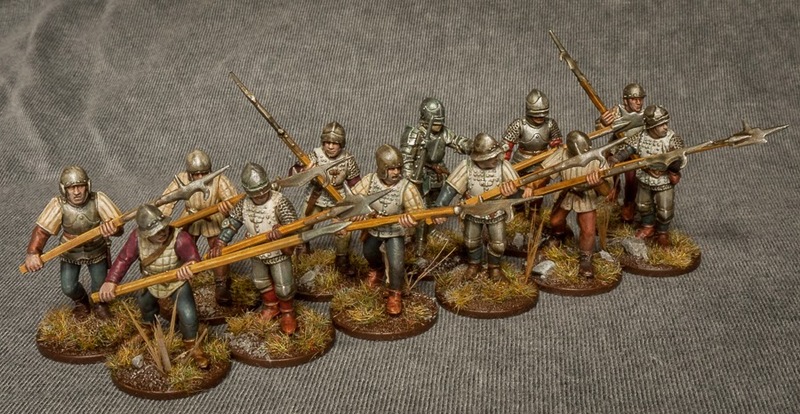 Here's an overview of how I am painting my Wars of the Roses retinue. I primed white and then washed all over with a light brown/khaki colour. The wash removes the starkness of the white and provides a useful guide to all the details. Each of the steps below equates to one painting session of around an hour or two. The first step is to paint all the cloth and garment areas, with mostly creams and off-whites for the quilted jackets. Grey and dull red/burgundy are key colours, but I also included some brighter red for the better off troops, and some browns and earths for the peasantry. 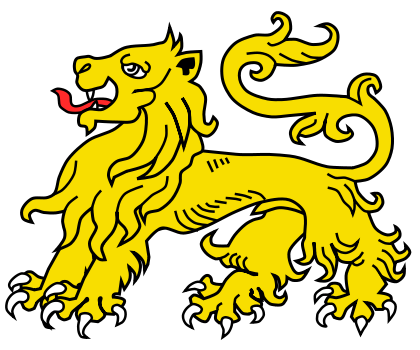 There's a basic, though not rigid, theme of brighter colours twinned with better armour. The next step is to continue with painting base colours, this time the leathers and flesh areas. The straps, bags and boots are painted in various browns. The brigandine jackets are painted light grey, the base colour for the white. The flesh is painted in my own mix, which roughly equates to the old GW tallarn flesh, plus a little green (to remove the orange cast), plus white to desaturate the tone. I have two flesh colours ready mixed and will use various combinations of these two pots. The third step is to paint the armour and weapons. The wooden shafts of the bills gets an orange-brown, while the armour gets a coat of chainmail. I also spotted a couple of gloves and straps that had been missed and filled these in. Not many colours, but a longer session because of the brigandine jackets, which ironically are not that riveting to paint. You could easily miss these out, it may have been that the rivets would all have been painted or covered in leather or fabric. Now that all the base colours are applied, it's time to shade and highlight. I generally try to do this with as little effort as possible, so washes and glazes are used whenever possible, with minimal highlighting. I mix up a glaze of the base colour plus a darker shade, add a little matt varnish to increase viscosity, then glaze. In this session I have painted the first glazes on the lighter garments, the weapon hafts and some of the leather areas. More shading in this step, all the metal areas. I want the armour to look quite bright, so I mix up blue, brown, green to give me a variety of grey/blue shades. These are glazed on as usual. Any areas that require a highlight I wipe off the glaze with the side of my brush bristles to leave the original metal colour showing through. I also re-highlighted the very bright areas with the original chainmail colour. More shading and a little weathering in this final step. The flesh is shaded with coat d'arms super wash light brown. Any light leather areas may well get a dab of this too. Then I highlighted the padded jackets with creams and ivory to give a little definition. More brown shading on eyes, lips and leathers, a little of which is also randomly stippled on legs and a few jackets to give a little dirt effect here and there. The final shading is with green grey, which when used in conjunction with previously shaded browns gives a nice murky effect for dirty trousers, and when used on light areas adds a nice shadow effect - here I use it on chins and cream clothing, and to define some areas of the bringandines. And that's about it for these figures, just basing to do, at which stage I may also dab in a little extra brown shading here and there if I think it's needed. Painting on the second unit for my Lion Rampant retinue is well under way. I have got through the very tedious stage of painting the base colours and am now at the far more interesting glazing and shading phase. It's here that the figures really start to come alive. In the background, you can see that I have also assembled and base coated the third unit, fully armoured men at arms. These will be so simple to paint that I may well include them in this month's work. That will officially put me one month ahead in Tale4Nerds, which is just as well as I am already wanting them finished and out of the way so I can get started on my next project. That's what happens when you visit a show! I have also had a gaming report from one of the more eager nerds. They have already had a few games (with unpainted figures!) and have given generally positive feedback. You can find the full report here in the wargaming dungeon. It's a simple ruleset and they managed to get three games in one night, though part of the reason for the rapidity was the continual failing to activate key units. I am not a fan of systems that allow a player to completely miss a turn due to a failed activation roll. Yes, the averages will even out. And yes, it will not happen too often. But it just seems wrong to me, that a player can potentially miss one (or more) turns and spend much of the game spectating as his opponent happily carries on. I am not jumping to conclusions, but already feel that we might need to house rule away such frustrations. Yesterday, I travelled with a couple of fellow gaming nerds to vapnartak in York, probably the biggest wargames show in the north of England? Dozens of traders and demonstration games, a few tournaments and hundreds of nerds milling around, peering into cabinets, blister packs and bargain bins. It was very busy to start with, especially on the bring and buy stalls, always a popular and crowded section of a wargames show. I went with a modest list of things to buy, looking for some dice and grass tufts, small items that are relatively expensive online because of postage. I was, of course, also keen to browse for anything interesting or unusual, and to hopefully sniff out a bargain or two. And I was hoping to get a look at some of the display games. After a good five hours of wandering around, with plenty of breaks for coffee and snacks, I think I just about achieved most of my aims. The grass tufts were a real disappointment, looking at the tiny blisters available I think I will be relying on my static grass collection, or ordering online. I did find a good variety of dice on one stall and now have a handful each of d4, d8, d10 and d12, for those few games that stray from the more usual cubes. On the bring and buy stalls I snapped up a box of Lord of the Rings elves and a few metal Saxons at giveaway prices. My most interesting discovery was found tucked away in a corner on a smaller stall, I think the guy was a painting service. What caught my eye was the glaring white of these plaster buildings, I am pretty sure they are 15mm scale. 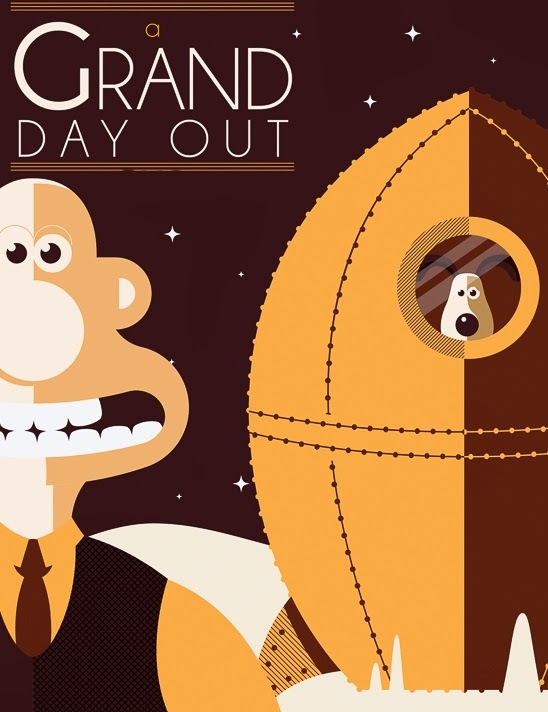 I have some grand ideas for these, not a trip to the moon, but I certainly hope it turns out to be a cracker. Groan, sorry, that was a bit cheesy. Okay, I will stop now.